Leo Kylie Jenner's Personal Horoscope And New Baby's Astrology! Born the 10th August, 1997 means the youngest Kardashian burns bright as a Leo! Moon In Scorpio in Kylie’s birth chart is significant, as the moon can quite literally represent our mother, and Kylie has her Moon transiting the same sign that features so strongly in her mom’s–Kris– (and dad’s) birth chart. With the moon in Scorpio she’ll be incredibly attuned to her elder sister (and parent’s) Scorpio style, and they will be able to learn from her, too. Our moon sign in the same zodiac constellation as those close to us can offer those people a sense of security, as the moon is how we naturally feel comfortable (while others are tapping into that energy through their Sun or Venus, say). Kylie’s new baby was born February 1st 2018, giving Leo Rising, Moon in Virgo and sun sign Aquarius (with Venus closely aligned with the sun in Aquarius, and Mercury in the sign too). 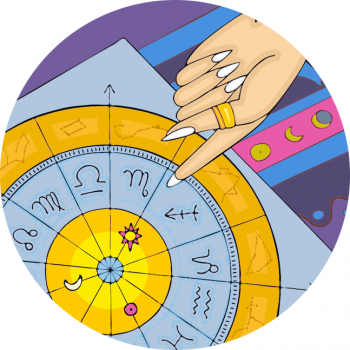 As a Capricorn Rising, Kylie has transformation planet Pluto presently connected to a significant point in her chart, slowly changing her identity in the world and how she perceives herself. At the time of birth, masculine, energising Mars was conjunct her natal Pluto, helping her break-through on a deep level. The moon in the mid-heaven shows Kylie is born to be a maternal figure, with a reputation for privacy and loyalty to her family. Expansive Jupiter is presently in her moon sign, heightening this side of her personality. Look closely at Kylie Jenner and you’ll spot the star’s zodiac sign! One of The Belles of Issue 6 for Carine Roitfeld’s CR Fashion Book, Kylie Jenner was photographed by Michael Avedon, with makeup by Matthew Vanleeuwen and hair by Maranda. Check out more astrology accessories to honour your astrological sign, here.